Why did the Bessarab-Brancovan seal show a spiked Turkish head? The 1690s were a time of war between the Turkish Empire and Holy Roman Empire (German) moving to prevent the loss of Vienna and the recapture of Buda and Belgrade. Wallachian rulers were critical allies in resisting Turkish advances. After twenty-five years of reign supported by Holy German Emperor Leopold I (more), Constantin Bassarab-Brancovan, the eighteenth and last of the family line to occupy the Wallachian throne, refused to submit to Turkish control. In 1714, betrayed and arrested in Bucharest, he was taken with his family, including four sons and grandson, to prison in Constantinople. Enormously wealthy his fortunes were stolen by Turkish rulers. Tortured along with his eldest son, he was brought in chains below the windows of Sultan Ahmet II. In turn, each of his four sons were beheaded before him. 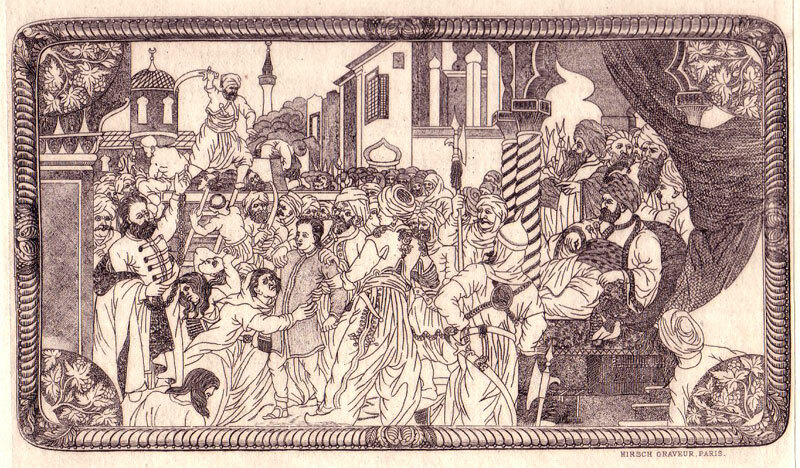 When his grandson’s turn came (center of picture above), Constantin in despair pleaded for his survival. Influential Turkish friends interceded successfully on the child’s behalf. Constantin was then beheaded. One of his enduring cultural legacies is an architectural style that was unique to Romania. This was visible in monastery complexes (more) built in his time. This style flourished into the first years of the 20th century.